ESTES PARK, Colo. – As my legs fatigued and my breath shortened, the photo and video enthusiast within me motivated me to keep going. “It’ll all be worth it,” I repeatedly said to myself, trekking higher and higher in altitude. Rocky Mountain National Park – where the majestic mountains near here roam the horizon, where striking wildlife populates the grounds and where exploration is abundant – is among the most respected American national parks. And what better way to capture this wonder than the ultimate adventure device – the GoPro. 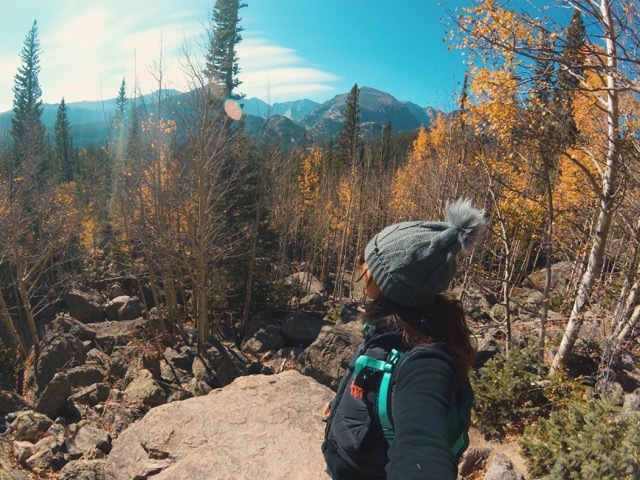 Writer and GoPro photographer Jenni York takes in the fall scenery in Rocky Mountain National Park (Photo by Jenni York). I’ll never forget the look on my face when I unwrapped my brand-new GoPro on my birthday; I’ll also never forget the rush of adrenaline that surged through me the very first time I used it – and every time after that. A GoPro, you say? Sure, it takes pictures and videos – so what makes it different from a standard camera? A device that adds a little extra excitement than your average travel photo, the GoPro is a small yet powerful, versatile device that satisfies recreational photo and video on an adventure anytime, anywhere. When it was time for yet another spontaneous trip, I found the perfect opportunity to bring along my most trustworthy travel buddy. A cross-country journey out west to Rocky Mountain National Park – where the driveable elevation reaches more than 12,000 feet – was the perfect destination to embrace my inner nature-enthusiast by capturing the breathtaking views, notable wildlife and memories with fellow adventurers. “Battery fully charged and a clean memory card – good to go!” I said to myself. It was the night before my first Colorado hike: My anticipation grew as I filled up my backpack with granola bars, water bottles and other outdoor necessities, preparing for day one in the autumn-booming Rocky Mountains. It has been 15 years since GoPro, Inc., a California-based company, launched the initial release of the GoPro 35mm HERO; yet, this compact device was the beginning of a photography and videography revolution. It was the first company to market a product that specialized in capturing photos and videos in extreme, action-based conditions. Since 2004, GoPro, Inc. has evolved the camera’s appearance, features, video quality and functionality, creating newer and more advanced models each year. In the last five years, GoPro’s most notable models are HERO, HERO4, HERO+, HERO5, HERO6 and GoPro Session. Click on the video above to see a GoPro view of a Rocky Mountain National Park sunrise (Video by Jenni York). The HERO Session 4 – my weapon of choice. Like most GoPros, it’s a small, portable video camera that is suitable for an adventure addict. Its lightweight, water-proof, long-lasting battery and wireless connection features allow for a more enjoyable experience. Virtually indestructible, it has image sensor capabilities and processors that provide an ultra-wide-angle lens, as well as built-in microphones. When my travel gang of four others and I arrived at our first destination, Bear Lake, a well-known Estes Park hiking site, I observed the large, wooden-framed map stationed at the lake’s entrance. I traced my finger down to “You Are Here,” planning my route with friends. Just like the stereotypical beginner-hikers we were, we went the wrong way, leading to a two-hour hike north of Bear Lake. “Excuse me, is there a lake nearby?” I asked two young women in passing. “There isn’t another lake for four miles!” replied Christina Lynn, a senior at Florida State University. At that moment of realization – and panic – I took a deep breath and reached my hands into my backpack’s small compartment to grab my GoPro. I walked to the edge of the mountainside that overlooked infinite miles of aspen trees at the peak of their fall, color transformation. I found a steady rock to position my GoPro on and extended the tripod legs. “Beep beep beep,” the GoPro sounded, as I held down the ON button. I quickly ran in front of the camera, propped myself up on a fallen tree trunk, raised my hands up and took in every second of my Queen-of-the-world moment, while recording the endless horizon behind me. Within 20 seconds, I had more than 100 still photos. “Woah, how did you do that? !” asked Brittany Chandani, my friend and classmate at the University of Miami. The GoPro Burst Mode has the ability to take a number of images at rapid speed, capturing a wider range of shots in a shorter span of time – and you’ll have plenty of photos to choose from! The camera’s wide lens component increases the amount of scenery captured in the frame, making it both easier and thrilling to seize the moment. Yes, you read that correctly – a GoPro has a variety of attachments that improve its functionality in all different ways, such as clipping it to your helmet to get those gnarly shots down the slopes. When you purchase a GoPro, it comes with adhesive mounts, allowing you to attach your camera to a number of surfaces. The most popular additional camera attachments include camera extension grips, tripods, mounts and or hand/wrist straps, all of which help to strengthen and adapt camera perspectives. As my friends and I journeyed towards Odessa Lake, a trail that runs along Bear Lake Road, a group of senior hikers were assembled on the side of the trail, flashing their hefty Canon cameras. “I stick with taking pictures on my Canon … I wouldn’t be able to figure out that technology,” said Jerry Smith, 60, a Bear Lake visitor from Salt Lake City. Someone who isn’t familiar with modern-day technology would argue that a GoPro is too difficult to use; however, as the GoPro market increased, online tutorials, demonstrations and social media accounts have boomed, helping to create an easier transition for beginners. One unique technological feature of a GoPro that separates it from its competitors – such as 4K action cameras – is the ability to connect the camera directly to an iOS or Android device by using its built-in WiFi and Bluetooth abilities. The software allows for accessing GoPro footage on the spot, meaning users gain full control over their camera display, live photo/video and the camera frame settings through the GoPro app. While it may be assumed that the GoPro market targets a more youthful generation, the uses for GoPros have expanded beyond extreme sports – its original intent. On our last day in quaint Estes Park, our alarms dinged at 5:30 a.m. and our iPhone thermometers read 30 degrees outside. We loaded up the van and began our ascension toward Alpine for sunrise. By 7 a.m., the Colorado clouds blended into a whirl of purples, blues, reds and oranges. My friend Jessica and I were perched on a rock at Many Parks Curve Overlook, dangling our legs over a cliff, while she firmly held her iPhone, snapping pictures of the evolving colors overhead. I, however, panned my GoPro across the horizon, creating a 180-degree panorama. “Usually sunrises aren’t great for videos since they happen so slowly,” Bruce Garrison, a journalism professor at the University of Miami and my trip advisor, expressed to me. Well, maybe not; however, whether an action-filled skydive out of an airplane, or a tranquil, vibrant sunrise, there is never a wrong time or place to capture a moment. And, the world might just be a little more awesome through a GoPro lens. Take tons of pictures — More footage means the more you can relive your favorite moments. Whether taking photos or videos, keep the camera rolling! Accessorize your camera — There are dozens of attachments to add to your camera to get better shots. Whether a bicycle mount, a helmet strap or a tripod, take advantage of what GoPro has to offer and play with perspective. Charge after every use — The last thing you want is a dead GoPro in the middle of your adventure. Go the extra mile – literally! — Embrace your journey and soak up the experience. Don’t be afraid to think outside the box and take risks with your GoPro – it’s your travel buddy!